OXFORD, Miss. 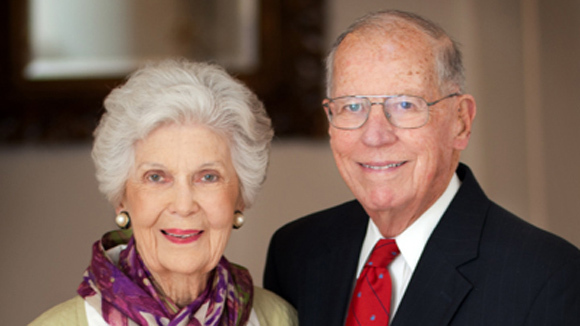 – Mississippi’s 58th governor and first lady, community builders William and Elise Winter, will receive the third annual Legacy Award from the Ole Miss Women’s Council for Philanthropy April 21 at the University of Mississippi. The Legacy Award recognizes the contributions of individuals who epitomize the council’s goals of philanthropy, leadership and mentorship. The Winters will appear at a 10 a.m. public ceremony in the Overby Center Auditorium. Admission is free, but registration is required. A $100-per-person brunch will follow at 11:30 a.m. at The Inn at Ole Miss, with proceeds benefiting OMWC scholarships, leadership training and mentoring programs. Both events are presented by C Spire Wireless. Providing additional support are gold sponsor Jones, Walker, Waechter, Poitevent, Carrère & Denègre LLP; and silver sponsors FedEx Corp., Entergy and Regions. “William and Elise Winter have lived their lives giving back to their state, their university, their community and their family,” said Jackson attorney Kathryn Hester, chair of the OMWC. “Gov. Winter, who championed education in Mississippi and racial reconciliation nationally, exemplifies one of the best leadership role models in the country. Winter said he and his wife are flattered by the Legacy Award. “Elise and I are aware that the goals and accomplishments of the Women’s Council set some very high standards, and we can only promise to do our best to justify this honor,” he said. “As we look around our native state today, we are immensely proud of what our fellow citizens have accomplished to make this a more attractive and desirable place in which to live. Some particular areas of progress have been in our greatly increased emphasis in providing better educational opportunities for all our citizens, in the elimination of racial segregation and blatant discrimination based on race, and in the increased national prestige and standing of Ole Miss and other institutions of learning in Mississippi. Winter is credited with spearheading Mississippi’s landmark Education Reform Act of 1982. The World War II veteran also was elected Mississippi lieutenant governor, treasurer, tax collector and representative. He was a shareholder/partner in the law firm Watkins Ludlam Winter & Stennis P.A., which recently merged with Jones, Walker, Waechter, Poitevent, Carrère & Denègre LLP, where he is special counsel. The university’s Institute for Racial Reconciliation and a history professorship are named for Winter as well as the state Archives and History Building. He has been honored with a special John F. Kennedy Profile in Courage Award for Lifetime Achievements. He has served as a Harvard University Institute of Politics fellow and on President Clinton’s Advisory Board on Race. Among leadership positions, he is chair of the National Commission on State and Local Public Service and president of the Mississippi Department of History Board of Trustees. He has also chaired the Kettering Foundation, National Civic League, Foundation for the Mid South, Commission on the Future of the South, Southern Regional Education Board and Southern Growth Policies Board. Elise Winter is a passionate advocate for and founding member of Habitat for Humanity/Metro Jackson, which has served hundreds of families. Her commitment inspired Habit for Humanity to create the Elise Winter Founders Award upon the Metro Jackson chapter’s 25th anniversary in 2011, and she was the inaugural recipient. She has been involved in every aspect of Habitat for Humanity, from the boardroom to worksites. Her book “Dinner at the Mansion” shares how she and her husband brought renowned guests to the Governor’s Mansion and gave the state positive exposure on the national and international level. Proceeds from the recently reprinted book support Habitat for Humanity. The Winters, who met while students at Ole Miss, are also involved in the Fondren Renaissance Foundation, which helps preserve and revitalize the greater Fondren neighborhood in Jackson. Andy Mullins – chief of staff to UM Chancellor Dan Jones, co-director of the Mississippi Teacher Corps and former special assistant to Gov. Winter – applauded the OMWC’s 2012 selection. The Legacy Award is an initiative of the 12-year-old OMWC, a group that attracts scholarship funds, pairs recipients with mentors and provides leadership training. Male and female scholarship recipients pledge to “give back” through community service. OMWC has built an endowment of almost $8.6 million and supports 61 scholarships, with each new scholarship recognized with a rosebush in a garden on campus. Those interested in helping students and using a naming opportunity to honor a special person may establish a scholarship. A contribution of $110,000 from an individual or $125,000 from a corporation or foundation can be paid in a lump sum or annually over several years. All sizes of contributions are welcome and used to further OMWC goals. To register for the program honoring the Winters or to purchase a brunch ticket, visit http://www.olemissalumni.com/events or call Theresa Knight at 662-915-1586. To learn more about the OMWC, contact Sarah Hollis at 662-915-1584, or visit http://www.umfoundation.com/omwc.